Baking Bread keeps me in the present moment, right here and now. Everything is allways here, only the form is changing. We found sweet potato at our local market. We had no idea what to do with these funny looking red roots. Somewhere in my memory I had seen bread with sweet potato. The sweet potato were very cheap, so we decided to buy a kilo. Back home I found the recipe at Wild Yeast and the next day I started to bake sweet potato. Of course we had to taste it before adding to the dough. The name says it all; sweet and potato. Because we bought a kilo I started to clean the rest and baked them like baked potato. I added some roasted potimarron with herbs from the oven. What a nice orange treat we had. Back to the bread; because I added the baked potato in the mixing machine most of the pieces were smashed. It gave the crumb a nice yellow-orange color. The bread had a thick crusty crust and a lovely crumb. The loaf had a nice oven spring. Sweet potato will be back in our house and in our bread! Mix all ingredients except sweet potato on low speed until combined, about 5 minutes. Add more water to get a medium consistency. Also add the sweet potato. Continue mixing on low or medium speed until the dough reaches a medium level of gluten development. When you do the window pane test you still see some thicker pieces of dough. Transfer the dough to a slightly oiled bowl. Cover and let ferment for 1.5 hours. Preshape into a ball, cover and let it rest for 25 minutes. Shape the dough into tight balls and place seam-side-up in linen-lined banneton. Place the banneton into a plastic bag and proof at room temperature for 2 hours. Check with your finger if the dough is proofed enough. When your finger indent springs back very slowly, it’s done. When it springs back quickly, the dough needs more time. You can place the banneton in plastic bag in the refrigerator for the night (8 – 12 hours) or bake it the same day. If you bake it the next day, take it out of the refrigerator 1 hour before baking it. Preheat the oven, with baking stone and your steam apparatus, to 230˚C. I scored the loaf with 3 cuts. Place the loaf on the baking stone. Bake for 15 minutes with steam and another 30 minutes without. When the loaf has a nice brown color, turn off the oven but leave the loaf with the door ajar for another 10 minutes. 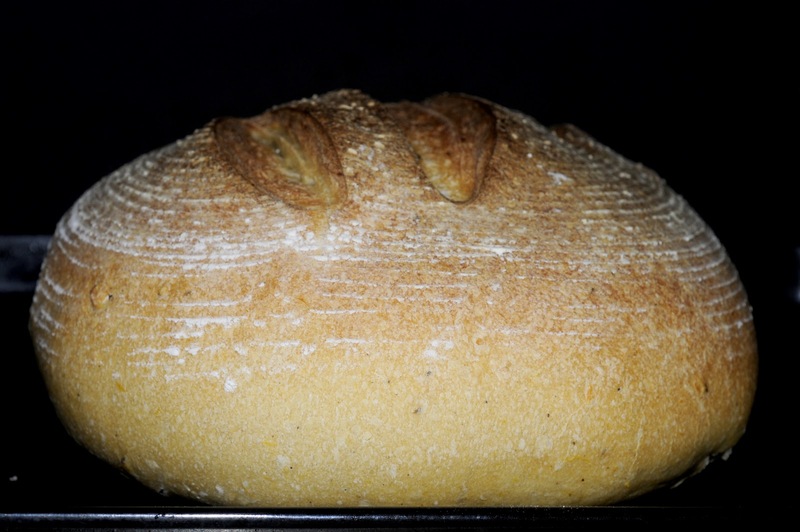 Let cool on a wire rack and enjoy this bread with a nice crumb and thick crust like we did. I love the idea of sweet potatoes in a loaf of bread - must be delicious! Thank you Winnie, I'm happy too with the looks. And the taste of sweet potatoes is delicious. You should try it and let me know so I will come and see your bread. Sweet Potatoes are a staple in New Guinea. I'm always interested in recipes that include them. Hi Singupi, we tasted them for the first time and we love them too. Now we see them everywhere on local markets. We ate them also like french fries; delicious. How is live in New Guinea? This is our project here in the North of Thailand; these girls go to school now every day, because people cared enough to help them with donations. I use European bread flours of Schmidt.